You are here: Home / News / Voter Suppression in the age of Republicans. Voter Suppression in the age of Republicans. (ThyBlackMan.com) I recently addressed a group filled with several of my brightest former college students utilizing the following enquiry: What is voter suppression? Most weren’t emphatically sure; however, let’s address this question in real time via this article. “Voter suppression” refers to tactics implemented with the intention of preventing large groups of the population from exercising their constitutional right to vote. In America, this is largely done as a way of preventing people of color from voting (i.e. African Americans, Hispanics, and Asians etc.). In general, voter suppression is by and large committed by one party; say…Republicans in order to prevent largely…I dunno’ Democrat populations from exercising their right to vote. In this annotation, we’ll explore various assimilated sources regarding the topic of voter suppression. We’ll seek to understand the various techniques of voter suppression within the United States of America. 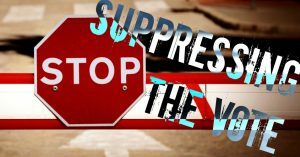 The American Civil Liberties Union (ACLU) published the following: ‘The Facts About Voter Suppression” citing several interesting facts and tidbits regarding voter suppression between 2008 and 2012. The first example is that, after an increase in voter interest/participation based in part due to the success of Barack Obama; in 2008, in many parts of the country witnessed increased voter suppression tactics. The ACLU reports that, between 2004 and 2008, the levels of participation by minorities (i.e. African Americans, Hispanics, and Asian Americans) all saw an increase. This increase ended up lowering the ‘voter participation gap’ between white and minority voters. To understand this in terms of statistics, it’s useful to consider that 2004 participation gap between white and minority voters was 6.9%; however, in 2008, that number dropped to 0.9%. This increased minority voter turnout led to ‘unprecedented diversity’ in the 2008 elections. Census data reveals an increase of 5 million voters (between the 2004 and 2008 elections). After a widespread increase in voter turnout, more than 30 states brought forth voter suppression legislation (2011). And 16 states ended up actually passing such legislation. The widely acclaimed ACLU, again states that it has conclusively been shown that African American and Hispanic voters are almost twice as likely to register to vote via voter registration drives as white citizens. For reference, it’s been found that (in the year 2008) 11.4% of African Americans and 9.6% of Hispanics used voter registration drives. For comparison, only 5.4% of white voters reported using voter registration drives. It’s also been found that, in 2008, African American voters were much more likely to use early voting. For reference, in Florida, 54% of African Americans utilized early voting sites. And, in Georgia, 35% of African Americans took advantage of early voting sites. In terms of Voter ID, it’s been found that, while 1 in 10 voters lack government-issued photo identification, 1 in 4 African America voters lack the same government-issued photo identification. In an interview with CBC radio, author Carol Anderson explained the more recent phenomenon of voter suppression. Anderson also brought up an important landmark in the USA during 2013. She explains that, “John Roberts, the chief justice, wrote a decision that basically said the Voting Rights Act has basically outlived its usefulness.” Here she refers to the overturning of the Voting Rights Act. But Anderson also makes a very crucial distinction. She asserts: “Who put Barack Obama in the White House? . . . You had an overwhelming number of African-Americans, Latinos, Asian-Americans and the poor, people who made less than $15,000 a year.” Here, she acknowledges that the Democratic base largely consisted of minority voters: those who felt racially ostracized, but also those who experienced massive amounts of income inequality. Here, we can see first-hand how the Republican party has, quite obviously, made it clear that they are trying to suppress the black vote. This, in fact, has been an effort to suppress the Democratic vote, in general. Now, The New Yorker has specifically addressed how voter suppression has manifested within the age of Donald Trump’s politics. Cobb expanded, noting that “North Carolina enacted restrictions on early voting, a policy that particularly affects African-Americans, who are likely to be hourly-wage workers and cannot always get to the polls on Election Day.” This is an important consideration to make, since hourly-age workers are largely ignored in a larger sense. Lastly, Cobb addresses voter ID laws. He explains: “Last year, the Supreme Court declined to hear an appeal to reinstate a voter-I.D. law in North Carolina that a federal court had found targeted black voters ‘with almost surgical precision.’” It’s no surprise that voter suppression has been a hot topic of conversation in the Trump era. There are many ways in which voter suppression takes form. In the USA, that has been largely through decreased election day/same-day voter registration, lowered amounts of voter registration drives, and an overall reduction in the chances of voters to actually register to vote. An unfortunate consequence of the racial divide between political parties, voter suppression is a lasting reminder of the racism so deeply-rooted in American society. I could talk about why voter suppression exist almost exclusively within the Republican Party to my students but that would of course be a subject for another course.